Why is there no consensus about the definition of ‘vegan’? Are abolitionists using the term differently than Vegan Outreach? What role does utilitarianism play in that group's positions? Continue reading to learn what this hominid thinks. Activism and theory are inseparable. Gary Francione wrote about this recently, and I'm glad he did. Regrettably, many ‘animal people’ aren't interested in theory. Although I was once among their ranks, I have learned that ignoring theory doesn't alter the role it plays. All activism stems from a set of ideas about what is true and appropriate. These ideas can be your own, in that you understand them, or someone else's, if you follow a group's program without much thought. While I admire the impulse to ‘just get active’, things aren't that simple. Fortunately, they aren't much more complex. Some reading and thinking are required, but it's not as if every activist needs to earn a fancy degree at an elite college. We must first acknowledge that the ‘animal movement’ is not united, either by an ultimate goal or by activist tactics. There are currently several distinct camps of advocates working independently. For example, ‘welfarists’ envision a future where we exploit nonhuman animals ‘humanely’. This camp, which has existed for over two hundred years, pursues legal regulations of exploitive industries. In recent decades, ‘new welfarists’ have used this tactic to achieve different goals. Many hope regulation will significantly reduce the number of nonhumans we use and kill. Their concern is often limited to specific animal species or forms of exploitation. Other new welfarists believe regulation is needed to eliminate all exploitation of sentient nonhumans. Their long-term vision is shared by abolitionists, a camp opposed to regulation on both moral and practical grounds. My position, as an abolitionist, is that all sentient beings have at least one right: not to be treated as property. In the words of Francione, recognizing this right demands that we, as a society, "stop our institutionalized exploitation of nonhuman animals; cease bringing domesticated nonhumans into existence; and stop killing non-domesticated animals and destroying their habitat" . To move society in this direction, abolitionists focus on a simple message: become a vegan. This is because veganism involves avoiding all forms of nonhuman exploitation in our daily lives. It encompasses our decisions about food, clothing, entertainment, and more. Abolitionists view veganism as the moral baseline of any effort to rectify human/nonhuman relations. In other words, because using and killing nonhuman animals is wrong, veganism is obligatory. Activists should be vegan and deliver an unequivocal vegan message to the public. Not everyone supports this use of the term vegan. For instance, the group Vegan Outreach (VO intermittently hereafter) doesn't base its work on rights theory. Matt Ball and Jack Norris, who formed VO in the early 1990s, have been adherents to utilitarian theory for over a decade. This shows up in everything their group does today — from its pamphlets and newsletters, to its definition of ‘vegan’. The guidance VO associates with this term has very little in common with that of the abolitionists. As the title of this essay suggests, ‘vegan’ is not used with much consistency. A wide range of definitions is offered by dictionaries, the news media, animal advocates, and other sources. It can be a confusing scene for both new and long-term advocates. This helps me understand the temptation to ask, as many have: if both Vegan Outreach and the abolitionists promote veganism, why aren't they united? Short answer: The theory guiding Vegan Outreach is incompatible with the theory guiding abolitionists. As a result, these camps engage in very different practices, and they disagree about the meaning of ‘veganism’. A complete response is beyond the scope of this essay. It requires thoroughly exploring the abolitionist approach, which I hope you will do soon, if you haven't already. The remainder of this essay focuses on another key to understanding this lack of unity: the ideas of VO and where they come from. Because the group is directed by utilitarians, we'll begin there. Utilitarianism is an ethical theory that was first formally developed by English philosopher Jeremy Bentham (1748-1832) . In the nearly two centuries since Bentham, multiple variants of utilitarianism have been introduced. Not surprisingly, this subject can become quite complex. What follows is only a brief summary of core ideas. Utilitarians work from the assumption that one or more states of affairs are "intrinsically valuable" (good on their own, not as a means to something else) . Examples include the experience of pleasure, absence of pain, and satisfaction of preferences. For utilitarians, morality is the task of "maximizing the occurrence of intrinsically valuable states of affairs". More succinctly, we should "maximize value" (and "minimize disvalue"). In principle, it's irrelevant to whom value is distributed. So, everything else being equal, providing one person ten ‘units’ of pleasure is morally equivalent to giving ten people one unit of pleasure each. Likewise, causing eleven people to lower the ‘amount’ of suffering they inflict from ten to nine is better than inspiring one person to reduce from ten to zero (hence the phrase ‘utilitarian calculus’). Utilitarianism is considered ‘consequentialist’ because it posits, "the rightness of an action is to be judged in terms of its results (consequences)" . Therefore, before deciding how to act, people should weigh and compare the anticipated outcomes for everyone affected by each available option . We should then choose whichever action produces the best overall result. Using this method, utilitarians can justify any conceivable behavior. They only need cause to believe the consequences of a behavior would balance out positively (e.g. the total amount of happiness in the world would increase). Utilitarian theory is incompatible with both human and nonhuman rights. This is because a right provides "non-consequential protection for an interest" (which is something that someone "wants, desires, or prefers") . In other words, a right protects an interest against being violated in order to produce what a group or individual predicts will be maximal consequences in terms of pleasure, pain, or another value. For example, people who protect your interest in continued existence with a right (i.e. recognize your right to life) would reject any plan to murder you and transplant your organs into several patients in need. They would make this judgment even knowing that such an operation could increase the sum life expectancy of everyone involved. To understand how utilitarianism relates to VO, we should discuss the person from whom their approach derives. A large segment of the modern ‘animal movement’ is heavily influenced, often indirectly and without its full awareness, by the work of Peter Singer, a utilitarian philosopher who is frequently mislabeled "father of the animal rights movement" . In truth, Singer is a leading intellectual in the animal welfare movement. He argues that we should reduce suffering by supporting adjustments, both legislated and voluntary, of how exploited nonhumans are treated (e.g. implementing alternative methods of slaughter and confinement) . Singer's focus on suffering and reform must be seen in light of his belief that nonhuman animals, except nonhuman great apes and perhaps a few other species, very likely don't have an interest in continuing to live . He describes the "wrongness of killing" nonhumans as "so much more complicated" than the wrongness making them suffer . This is because animals who aren't human possess no "mental continuity", or an "understanding of what it is to exist over a period of time". Singer, on these grounds, "can respect conscientious people who take care to eat only meat that comes from" nonhumans who have been "killed quickly and without pain" after living "a pleasant existence in a social group suited to their behavioral needs" . Many of Singer's thoughts on nonhumans, including the matter of killing them, echo Jeremy Bentham (1748-1832), the utilitarian philosopher and social reformer who helped stimulate animal welfare legislation in England. Bentham is responsible for the frequently quoted (and misunderstood) statement: "The question is not, Can they reason? nor, Can they talk? but, Can they suffer?" . Bentham's ‘question’ represents a significant turning point in history. He was rejecting many of the reasons frequently offered for excluding nonhuman animals from any moral consideration. However, he didn't argue that nonhumans have a right not to be used and killed . (Bentham wasn't a vegetarian, and he described rights as "nonsense" .) He only meant that nonhumans' suffering should enter into our utilitarian calculations — at least in principle. Eating nonhumans was deemed acceptable because "we are the better for it" and they, lacking "long-protracted anticipations of future misery", are "never the worse for being dead" . According to Francione, the "primary issue" for Bentham was not "whether we used animals, but how we used them". His "modern proponent", Peter Singer, still holds this view . Some groups and individuals influenced by Singer are linking the term vegan with a utilitarian approach. It permits, if not requires, behaviors clearly inconsistent with a careful and earnest rejection of all nonhuman exploitation. In other words, it provides excuses for eating, wearing, and otherwise using animals who aren't human. This is morally problematic and contrary to the term's historical development. Vegan Outreach is the prime example of a large organization that consistently abuses ‘vegan’ in such a manner. Of course, utilitarian ideas manifest throughout ‘animal advocacy’, not just in certain uses of the term vegan . At the center of VO's approach is the following principle: all activist efforts should be formulated to maximally achieve net reductions of nonhuman suffering. A crucial concept here, represented by ‘net’, is that we should focus on the overall effect of our actions. On VO's interpretation of this principle, ‘vegans’ should be encouraged to shun diligence and consistency. In particular, striving to avoid "minor or hidden animal-derived ingredients" and behaving the same way no matter who is with us are detrimental habits . They can hinder efforts to reduce suffering by bolstering the public's perception that veganism entails doing "bold and uncomfortable things". Vegans have an obligation to keep their lifestyle from appearing "petty and impossible" . For example, we shouldn't worry about vitamin D3, avoid sugar filtered with bone charcoal, or ask restaurant staff about ingredients in the presence of "nonveg friends and family". We can also "make the vegan case seem absurd" by openly objecting to exploitation endured by invertebrate animals, such as the bees who are used for honey and other substances . 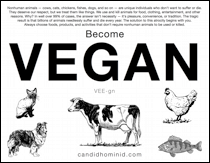 VO contends that veganism is "merely a tool to reduce suffering", not "an end in and of itself" . Other suitable tools include handing out literature, making monetary donations, and pursuing welfare regulations. People who follow the group's "results based" approach have several ways to pacify their conscience without ceasing to eat, wear, and otherwise use nonhuman animals . For instance, VO has argued that a "half hour of leafleting will likely reduce more suffering than going from 99.0 to 99.9% vegan for one's entire lifetime" . In other words, a brief stint of activism can justify a lifetime of ‘cheating’ on occasion and being apathetic about the ‘details’ of avoiding nonhuman exploitation. The tool VO labels ‘vegan’ is nothing more than guidance for eating a predominantly herbivorous diet. Considering the many exceptions allowed or necessitated, this ‘vegan’ almost certainly doesn't meet the standard typically associated with ‘strict vegetarian’. VO's focus on diet is directly related to the utilitarian theory that underpins their work. It's a calculated response to the fact that more nonhumans are used for food than all other purposes . Of course, less suffering is generated by the many forms of exploitation involving fewer individuals. This means activists who explicitly reject non-food purposed exploitation, such as that related to clothing and entertainment, are unfavorably balancing "trade-offs of time, money, and energy" . Ultimately, the most effective path to reduced suffering is exposing people to the "realities of factory farming" and urging them to decrease or eliminate their purchases of overt "meat, eggs, and dairy products" . Singer, despite his utilitarianism, will often use ‘rights’ as a rhetorical device or "convenient political shorthand" . In a similarly brazen fashion, the group that calls itself Vegan Outreach has co-opted the term vegan. Their use of ‘vegan’ is divorced from history — vegan in name only. More importantly, it encourages lax attitudes and behaviors regarding nonhuman exploitation. To close, a note that might interest potential commenters. This essay is not a personal attack on anyone. My intent is to explore modern use of the term vegan and explain vitally important differences between two prominent camps of ‘animal advocates’. So yes, it's ‘divisive’. Not in the sense of attempting to enflame pointless acrimony, but of illuminating a divide that already exists, can't be bridged, and must not be ignored by serious activists. Stanford Encyclopedia of Philosophy. "The History of Utilitarianism"
 This is the position of act-utilitarians, including Peter Singer. Rule-utilitarians differ here significantly. Rather than recommending decisions be evaluated on a case-by-case basis, they believe we should act in accordance with rules that will lead to the best outcomes if followed by everyone. Francione has written critically of Great Ape Project, an international organization founded by Singer and Cavalieri following the release of their 1993 volume of the same name. In his 2006 essay "The Great Ape Project: Not so Great", Francione argues that GAP reinforces anthropocentrism and "speciesist hierarchy" by suggesting that "a certain species of nonhuman is ‘special’ based on similarity to humans". Also reference chapter 3, "Taking Sentience Seriously", of his 2008 book "Animals as Persons", and his 2007 essay "Equality and Similarity to Humans". This analysis of Bentham is derived from Gary Francione. Reference chapter 6, "Having Our Cow and Eating Her Too: Bentham's Mistake", of his 2000 book "Introduction to Animal Rights", and chapter 3, "Taking Sentience Seriously", of his 2008 book "Animals as Persons". Quote also found here: Vegan Outreach. "Excerpts from How Are We to Live? by Peter Singer"
Matt Ball in Vegan Outreach's newsletter for June 5, 2003: "To this end, we need to make as big a change as possible with as many people as possible, rather than, as you note, worry about honey or sponges". Matt Ball in Vegan Outreach's newsletter for June 5, 2003: "If eating meat would lead to less suffering, I would do it". Abolitionists might use this fact to help explain why many single-issue campaigns are problematic. For instance, see Gary Francione's 2010 essay "Is Every Campaign a Single-Issue Campaign?". However, they hold that it doesn't affect our moral duties or how the movement should be structured. Peter Singer has suggested there is a problem of "diminishing marginal returns" (a concept borrowed from economics). Specifically, activists' ability to reduce suffering diminishes as their message becomes increasingly inclusive of exploitation forms that involve fewer nonhumans (e.g. vivisection and rodeos). Reference his 2006 audio interview about utilitarianism with Alan Saunders (time 23:50). Vegan Outreach states in an FAQ: "If 5% of Americans were to stop eating animals, far more suffering would be prevented than if we completely abolished every other form of animal exploitation in the United States". In his 1978 article "The Fable of the Fox and the Unliberated Animals", Singer states: "With the benefit of hindsight, I regret that I did allow the concept of a right to intrude into [the 1st edition of "Animal Liberation" (1975)]; it would have avoided misunderstanding if I had not made this concession to popular moral rhetoric". In the book's 2nd edition (1990), he clearly explains that his argument is not based on rights. However, in other public communications, Singer still ‘concedes’ to the term. For instance, he doesn't object to being described as the "‘godfather’ of the animal rights movement" during a 2006 interview with Satya Magazine. Shared and updated at AbolitionOfSpeciesism.tk ! Can I translate it and publish it in Spanish in my personal blog (pablofernandezberi.blogspot.com)? Wow...of course, sharing. Thank-you for writing this. Nathan where did your fantastic pamphlet go? Thanks for this very clear essay. When I first became vegan, I thought VO was a wonderful source of information. Looking back, I realize it was all health and/or welfare related. Even though I began my journey as an abolitionist, I had never heard of the movement and didn't realize that all vegans were NOT interested in the total non-use of non-humans. I assumed we were all on the same page. Thanks to essays like yours and others and, naturally, the wealth of theory/philosophy in Francione's works, I'm finally able to put some puzzle pieces in place. I'm so grateful for those of you who can put these perspectives in writing! You're doing the movement a great service. It does seem to come down to a battle between the deontologists and the consequentialists. To be honest I find it hard to grasp how someone who is well read on ethical philosophy, including Singer, can still cling to a deontology. Is a soybean plant really so different from a sea sponge (which doesn't even have neurons)? 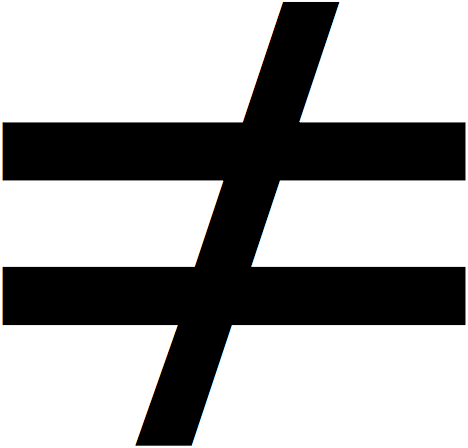 On what basis are they ethically distinct? Why should we assume a phylogenetic category (of man's invention) has inherent ethical value or right to life, while other forms of life don't? Thanks for commenting. I'm pleased you found the essay helpful. I don't think ‘animal advocacy’ is as simple as consequentialists vs. deontologists, but that is an important piece of the puzzle. For instance, although Tom Regan (The Case for Animal Rights, 1983) and Gary Francione (Introduction to Animal Rights, 2000) both take a deontological approach, they disagree on some very significant points. For one, the scope of rights. Francione argues, and I agree, that everyone who is sentient has basic rights. Regan holds that rights should be limited to "subjects of a life" (it's complicated, but basically nonhuman mammals and birds of a certain age, and perhaps other vertebrates). As for the remainder of your comment, I believe you are asking about "where to draw the line". You are right to suggest that arbitrarily assigning value to everything in the category "animal" makes no sense. The basis for membership in the moral community is sentience (basically, some kind of self-awareness). It just so happens that nearly every being that humans currently classify as "animal" is definitely or probably sentient. Sea sponges are one of the few exceptions (based on what I know). So, yes, sea sponges aren't morally distinct from plants. Both don't have interests — because they can't want, desire, or prefer anything — so it's not possible to have duties directly to either one. It's interesting that you equate sentience with self-awareness. I think it's tricky to define, but there's a lot more to sentience than just self-awareness. I'm fine with accepting that definition for the sake of discussion, but it's an unusually limited definition, considering the breadth of traits commonly associated with sentience. Also interesting is your claim that nearly every member of the animal kingdom is self-aware. You won't find much support for that idea in the scientific community. Only a tiny minority of animals display self-awareness. There I describe my level of confidence in the sentience of invertebrate animals with nervous systems but no discernible brains — like jellyfishes, sea anemones, and sea stars — as only *possible*. Nevertheless, I see no reason not to give the members of these species the benefit of our doubt. Of course, they aren't commonly exploited anyway. It's clear, at least from what I've read, that her capabilities theory doesn't rule out domestication. In that it would require us to reevaluate how we treat domesticated nonhumans, it seems like just another take on welfarism.